A full programme of ringing in churches on routes leading to the town, an interesting business meeting, well conducted, with a fair proportion of those present taking part, a bright church service with good singing, the address by the rector although over 15 minutes that seemed only like five, a home-made tea, plentiful and well served by local ladies, followed by more ringing at several other churches until all had had their fill; such was the pattern - as in many other areas - when the Winchester and Portsmouth Guild held their A.G.M. at Basingstoke on July 4. Although better support should have been forthcoming from the large guild membership, the 60-70 who did turn up found the friendly atmosphere (always forthcoming from Basingstoke ringers) most convivial, the striking generally good and altogether a well worth while event. An Executive Committee meeting in All Saints’ Hall held before the main business of the day overran the hour allotted, but this gave those waiting the opportunity to see the carnival procession, which Basingstoke had arranged, it seemed, especially for the occasion ! The master (Mr. Roger Savory) presided at the meeting, accompanied by the hon. secretary (Mr. David Forder), the acting hon. treasurer (Mr. Kenneth Croft) and the Editor of The Ringing World (Mr. Charles Denyer. A welcome to the last named and also to other visitors was given by Mr. Savory, and among the apologies received were those from Canon K. W. H. Felstead and Mr. A. York-Bramble. The company remembered in silence Mr. and Mrs. T. H. Francis, Messrs. F. Attrill, F. Gosling, S. Carey, S. Blake, J. W. Faithfull, A. Jackson and Mesdames W. Tate, G. M. Hunt and R. May, who had died during the year. Following the lengthy minutes, the secretary read a letter from Mr. John Hunt regarding peal ringing and the guild rules, and this will now be dealt with in committee with a view to a proposition being made at the 1971 A.G.M. Before the accounts were presented, the chairman spoke of the work of the late treasurer (Mr. Tom Francis) and said that with Mr. Kenneth Croft’s co-operation and the Executive Committee’s agreement (and the appropriate rule) Mr. Croft would assume the duties of hon. treasurer until next year’s triennial election, but as the secretary had done both offices since Mr. Francis’ death Mr. Forder would present the accounts for 1969. These showed that the balance of £319 15s. 10d. had been reduced to £198 5s. 4d., but as printing the triennial reports had cost £252 the loss was not what it appeared to be. The question of a modified - possibly annual - report replacing the larger one was being studied. Mr. Francis, it was pointed out, had prepared the accounts - one of his last acts for the guild. The treasurer’s statement of accounts were received without comment. The master pointed out that because the Erin Caters had been approved it did not follow that any other similar peals, or of Major with a cover bell, would be accepted. Congratulations were extended to Katherine Maundrell (leading peal ringer - 34), to Geoffrey Dodd (leading conductor - 21) and North Stoneham, where 17 peals had been rung. Apologising for not having submitted a report last year, Mr. M. J. Butler (librarian) stated that the late Mr. Tony Jackson’s mother had handed Tony’s collection of ringing books to the guild library, and appreciation of this gift was expressed. 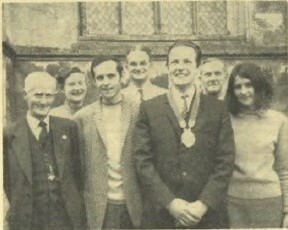 The master (Mr. Roger Savory) wearing the badge of his office and accompanied by (left to right): Mr. C. Ossler, Mrs. M. Croft, Mr. D. Forder (hon. Sec. ), Mr. K. Croft (hon. treas. ), Mr. J. Chesterman and Miss L. Cull. [R.W. photo. A comprehensive report of the Central Council’s meeting at Ilkley was given by Mr. A. V. Davis and by Mr. Hartless. The members learned that it was a long and interesting meeting with much improved organisation and arrangements, and a real Yorkshire welcome. Both gentlemen were applauded for their explanation of what took place. Giving his comments on the year’s work as he had seen it, the hon. secretary spoke of the tragic deaths of Tom and Margaret Francis; the former had been treasurer and had served the guild and other associations well, and Margaret had been secretary of the old Southampton District. A memorial to them, erected by their family in North Stoneham belfry, would be dedicated in August. Restoration work had been completed in Bishop’s Waltham, and they had a new ringing tower with a ring of six at Easton. The second annual dinner was a highly successful event, as was the striking competition, won by Eling. The secretary then gave details of work in the various districts, which generally were satisfactory, but a close watch is to be kept on membership, so that there will be no decline. Although no guild applications had been received for restoration grants, the Bath and Wells “Stinchcombe Bells Appeal” was discussed and the committee had recommended that £5 be sent when the work is put in hand. Mr. F. E. Collins made a proposition, stating that this was a test case which should be supported. Canon Paton-Bradbury seconded. The proposition was carried, no contrary votes being recorded. to be sent. When nothing had been received he had asked the guild master, at Ilkley, to do something about it. Unfortunately it was another three weeks before the report arrived, and this was much too late for full publication. He hoped to be present himself next year and would see that a report did appear on time. The guild striking competition is also now a definite date - the third Saturday in May each year, and the same sub-committee were given authority to organise the event. According to a rota system in operation, the A.G.M. in 1971 is to be held on the first Saturday in July at Ryde, I.O.W., it being stated by Mr. Bailey that a keen young band there would welcome the guild. When “other business” was announced, Canon Paton-Bradbury rose and objected to the practice which, according to the rules, necessitated the names of non-paid-up members being read out at the annual district meetings. He was supported by Canon Sanders and several other members. It was stated by Mr. A. V. Davis that he had yet to attend a meeting where this had happened, as the district officers allowed much more latitude despite the rules. Others present also agreed that the rule in this case was not enforced.- No action was taken. It was announced that Canon Felstead would be leaving St. Michael’s, Southampton, later in the year to become master of St. Cross, and a message of congratulation and good wishes is to be sent to him from the guild. Mr. A. V. Davis proposed that £10 be sent to The Ringing World funds. He felt it necessary, he said, to do all possible to support and encourage the paper, and now that they had a new editor and a new look it was even more necessary to give help. Mr. D. Matkin seconded, but Mr. F. E. Collins spoke against the motion and said it was not right to use guild moneys in this way. “Raise the price to 2s.,” he said. After the motion had been approved by 41 to 6, the Editor asked permission to speak, which was granted. Mr. Denyer said he did not control The Ringing World. This was done by a committee (under the Central Council), who worked hard to keep it going. He pointed out that the paper was owned by the Central Council, and that as the Winchester and Portsmouth Guild was affiliated to that body, the paper virtually belonged in part to all those members present. As such they should support The Ringing World wholeheartedly. Regarding the price, this probably would have to go up next year, although he, personally, hoped to keep it down. So many letters came in at “renewal” time from the old subscribers who could not now afford The Ringing World because of rising costs elsewhere and they had to economise; The Ringing World subscription was one of these economies. He appealed to all members of the guild and to ringers everywhere to go on supporting The Ringing World and to help to increase the circulation. A final word from the master included thanks to all who had helped to organise the day’s activities and a reminder that at next year’s triennial elections neither he nor the secretary would be seeking re-election. The guild’s service was conducted by the rector of Basingstoke in St. Michael’s Church at 5 p.m., and tea was served afterwards in the church hall.